I CAN'T tell you how much I want to crawl back into that bed. There have been changes a-plenty around here and there's more to come. Some have been spectacularly grand, like a darling healthy baby step-granddaughter. Others have been a roller-coaster ride with all the obligatory ups, downs and loop-the-loops. Take, for instance being told my job is redundant only to come through the company's processes and find I am one of the lucky buggers to be retained, but there's another opportunity - a bucket list kind of offering - in the offing. Yup. This was the full dip of despair; slow, agonising climb to the heady heights of relief; full tilt to the triple loop ending somewhere between pass-the-bucket and can-I-have-another stick-of-fairy-floss-please. Long story short, the last of the "new" I alluded to in a recent post is a new job. Yes, a new job - not a baby announcement as Kylie had a stab at. Good Lord, the last of our brood finishes high school on Friday, what would I be thinking? Though not a baby, changing jobs is still big. It was with great trepidation, very great trepidation, that I stepped away from the News Limited family I have known and loved for the past 10 years and started as UNICEF Australia's media and communications manager last week. While I get used to the new role, blogging may be a little sporadic but be assured I'll be here and maybe even picking your brains for how I can rope this lovely little community of ours into using its voice for good. If you haven't already, register for Blog Action Day on October 15 and have a crack at doing just that - using your blogging voice for good. I took part in Blog Action Day in its second year. You can see the post here, which ironically accompanies a much younger me, age 18, holding a new-born baby while on a volunteer aid assignment in Bangladesh. The assignment was a UNICEF health project and I was there as a Girl Guide. Isn't it amazing how things come full circle? Congratulations! My position was made redundant around 2 months ago and I've been going on the rollercoaster of "oh this is the best thing that has happened" to "OMG, I better find a job soon" to "oh well, I can try to live more frugally" to "OMG". I do get up in the morning though. Congratulations on your new job! 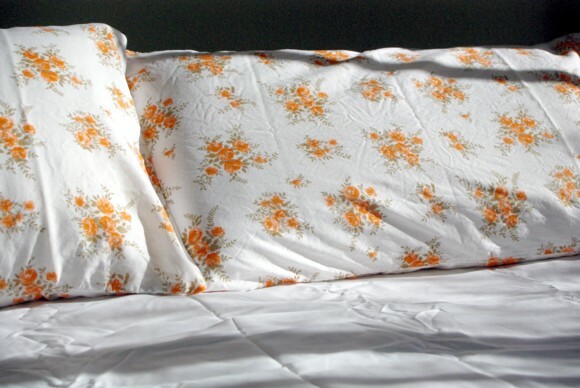 Just love your floral pillowcases by the way..so much fun to wake up with. I am having a 'giveaway' for a little girls pink tote that I made yesterday..just in case you know of any that would like one. So I got it wrong. Well I never was that good at guessing. But hey you - congratulations on the new job!!!!!!! That IS amazingly lovely news. And good luck with it too. Great news. You'll do wonders.